Voyages-sncf.com is the official European distribution channel of the French railways (SNCF) for online sales of high-speed and conventional rail travel throughout France and Europe. Ginger Juice has delivered several promotional campaigns on social media, targeted towards UK travel agents – on both Facebook and Twitter. Our latest project included used a Facebook competition tab to drive engagement. 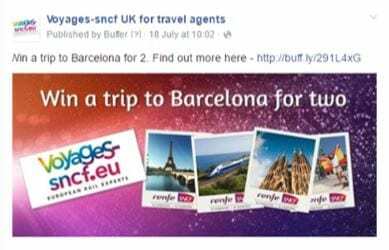 Agents were encourages to take part in a sweepstake, hosted on the clients Facebook page. 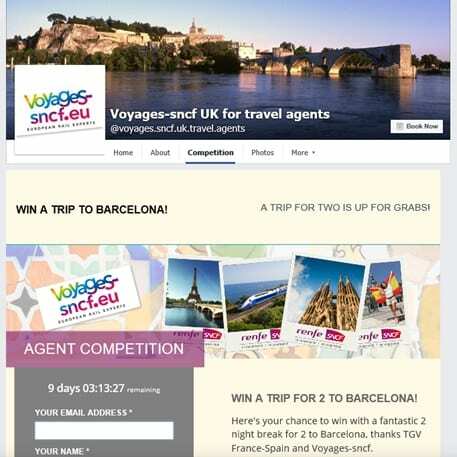 The contest attracted over 200 agents and reached 20,000 agents in the UK.